On a recent Saturday morning in Burlington, heavy gray clouds hang over the city. Rain pelts the produce at the Farmers' Market in City Hall Park, and potential hikers scotch their plans for a glimpse of early fall foliage in the mountains. For nearly everyone in the state's largest metropolis, the day is a washout. Well, not quite everyone. In a cavernous basement on Riverside Avenue, the mood is upbeat. Brazilian music plays from a stereo; the smells of coffee and bike grease mingle in the air, a curiously uplifting mix. The skeletons of a half-dozen bikes are suspended on stands around the space. An equal number of guys - from elementary-school-aged to retirees - are wielding wrenches and other tools. "This one's had a couple of hard miles," says Tom Buckley of Winooski, nodding at the cadet-blue Specialized Rock Hopper in front of him. Next to Buckley, 14-year-old Tony Chen is examining the brakes on an olive-green Fuji and debating whether the front tire's got some dry rot. In a back storage room, Mark Rowell roams among plastic bins of cranks, seat-posts and reflectors. Loops of black bike tubes hang like dreadlocks on a pillar. Makeshift cardboard signs read: "Good 26-inch tubes" and "27-inch wheels." Venturing deeper into the cellar, Rowell points to a row of Raleigh, Gary Fisher and other assorted bikes that seem ready for takeoff. "I look at this as the Humane Society," he says. "These bikes are all waiting for good homes." Rowell is half-joking, but he's right. The 52-year-old is co-coordinator of a nonprofit that's providing wheels to those in need. This room, these parts and bikes, and the people who work on them make up Bike Recycle Vermont. Now in its third year, BRV is transforming the lives of both the bike mechanics and the bike recipients. As Rowell puts it, "It's a win-win situation." Bike Recycle Vermont got rolling in July 2004 thanks to Ron Manganiello of South Burlington, who had heard that a refugee family was in need of reliable transportation. By that winter, he had begun working with Good News Garage - the Burlington nonprofit that donates cars to low-income Vermonters - as well as local bike shops including the Old Spokes Home, and tried to find a permanent space for BRV. The result: the current quarters on Riverside Avenue, which have become an informal community center for donators, volunteers and people in need of their own wheels. "It's sort of a party here," says Rowell, a Burlington resident and father of two girls. He joined BRV in 2005 after working as an after-school coordinator at Lawrence Barnes Elementary. A drum player who sometimes brings his congas to the shop, Rowell regularly spins tracks of world music with Wilson Skinner, an AmeriCorps VISTA member who's posted at Bike Recycle Vermont. "Bossa novas, salsas - up music," explains Rowell. Today, he and Skinner are manning the shop while Manganiello works behind the scenes, writing grants, finding additional storage space for bikes, and building relationships with benefactors. Affiliated with Local Motion, a biking, running and walking advocacy group, BRV has also hooked up with numerous Burlington-area businesses, agencies and schools to round out its support network and services. This month, BRV won its second "Hometown Hero" award from the United Way, which means $2000 and a new laptop for the shop. A more telling figure of the outfit's success is the number of bikes it has donated to the community - 2000. "I've had several people tell me that there are more people on bikes in this neighborhood than there ever have been," says Rowell proudly. While Vermont Bicycle Touring has donated dozens of bikes to BRV, most of the rides in the Riverside shop come from Chittenden County families who are cleaning out clutter. "Their bikes wouldn't fetch much at a bike swap, and here, it's a tax write-off," notes Rowell. "And we're probably doubling the life of the bike." 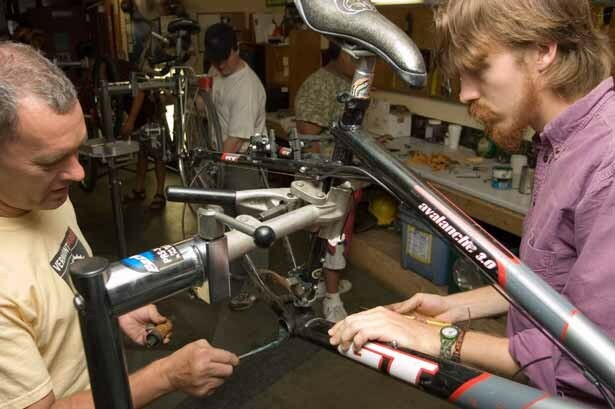 Every third Saturday of the month, BRV hosts a "bike jam" where avid cyclists can practice their fix-up skills. "It's great conversation, fabulous music and like-minded people," says Phil Hammerslough of Essex, a longtime bicycle advocate. On weekdays and other weekends, several high school students help staff the shop. "Many of them have academic or behavioral problems," says Rowell, who this month began working with Barnes students, taking them on long rides every Monday afternoon. "But when they come down here, they're great. It's like a reclaiming. They're sensing: 'There's something in the world for me, something I might be able to excel at.'" Once the bikes are ready to go, Rowell works to match them with recipients, whose needs are assessed through a simple application. There's no charge for bikes or helmets, but locks are $10 apiece. Repairs cost a few dollars, depending on the parts, and BRV usually works with riders to show them how to patch a tire or tighten a brake on their own. In accordance with BRV's original mission, many of the 2000 bikes have gone to refugee families who are now able to get to jobs at T.J. Maxx, Vermont Teddy Bear Factory and beyond. "When they get here, they don't have a license, they can't drive a car," says Vermont Refugee Resettlement Program volunteer Molly Godin, 27, of Burlington. "It gives them a mode of transportation and allows them to become part of the community." As a former host for a single mom with five kids from Somalia, Mark Redmond says that Bike Recycle Vermont gave the family some simple fun upon their arrival. "They were delighted," says Redmond, who as the executive director for Spectrum Youth and Family Services also finds bikes for kids in shelters. "Burlington is a biker's paradise," he says. "Now, we can go on outings - without Bike Recycle Vermont, we could never afford these bikes." For many of those involved with BRV, the rehabbed bicycles have become more than simple transportation. A sign on one shop wall reads: "Less oil, more courage," and has a drawing of a bicycle with two planet Earths as its wheels. "When you ride a bike, you realize your own strengths," enthuses Hammerslough. "You gain more independence and become less dependent on cars. It's a great way to build self-esteem." Last month, 69-year-old Robert Fountain visited BRV headquarters because his 1990 Chevy Corsica was on the fritz. Now, he rides a bronze-colored Columbia three-speed from his home at Fern Hill to the Burlington Senior Center on North Winooski, and to his doctor's office. A former truck driver, Fountain has gone from 18 wheels to two, and finds the freedom unparalleled. "You see the world differently from a bike," he says. Not everyone has a lasting relationship with a bike, of course. Rowell says he sees BRV bikes abandoned around downtown; eventually, he figures, the Department of Public Works chops off the locks and the bikes disappear. "But if a bike has been out there on the streets for a year, it's served its purpose," says Rowell. Without a lock, a bike can disappear much faster. Until recently, Stephanie Potter rode a Kona that she valued at $1000. "It was an extension of myself," she says. "It was my only transportation." One day, Potter leaned the Kona against her Burlington home while she dropped groceries off inside, intending to go for another ride. When she came out, the bike was gone. "I was filled with anger; I lost my feeling of safety; I basically took to my bed for two weeks," she laments. A visit to BRV gave Potter not only a second set of wheels but a renewed outlook. "It was an instant shift to, 'Wow, there's something good about t his world,'" she says. "If you're a poor person in Burlington, you're just walking around, looking at garbage with your head down. But when you get on your bike, you're out there in the world with the rest of humanity." The next bike jam is Saturday, October 20, at 664 Riverside Avenue, 9 a.m. - 1 p.m. For more information on Bike Recycle Vermont, call 264-9687.